Inspired by the life of U.S. Supreme Court Justice and pop culture icon Ruth Bader Ginsburg, RBG arrives on Digital HD August 3, and on Blu-ray and DVD on August 28 from Magnolia Home Entertainment. From Directors Betsy West (Makers: Women Who Make America) and Julie Cohen (American Veteran, The Sturgeon Queens), and produced by Storyville Films and CNN Films, the powerful, thought-provoking documentary follows the life of Ginsburg from her childhood to her career as a groundbreaking attorney, to her current role as a Supreme Court Justice. The 85-year-old’s legacy thrives as she continues her role as one of the most prominent Supreme Court Justices of our time. Taking a stand for an array of voiceless minorities and respectfully dissenting on their behalf, Ginsburg continues to redefine the American way by fighting for change. Affectionately nicknamed “Notorious RBG,” she is known to many as a pop culture icon, but very few are aware of her personal journey toward becoming the phenomenon she is today. Featuring interviews with Ginsburg and those closest to her, RBG highlights the Supreme Court Justice’s untold story and the battles she’s faced in and outside of courtroom. In RBG’s featured home video collections, Academy Award®, Golden Globe® and Grammy® Award-winning actress and singer Jennifer Hudson sings the film’s original song, “I’ll Fight.” The stirring and powerful original song was written and arranged by the nine-time Academy Award-nominated and Grammy, Emmy and Golden Globe-winning songwriter Diane Warren. Fans of the “Notorious RBG” will also enjoy exclusive special features including deleted and extended scenes, and additional interviews. 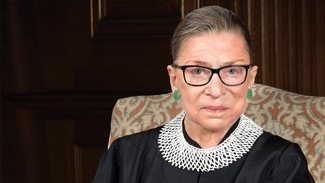 RBG arrives on Digital HD via iTunes, Prime Video, FandangoNOW, Google Play and additional digital retailers on August 3. The documentary will also be available on Blu-ray and DVD for the suggested retail prices of $29.98 and $26.98, respectively. At the age of 85, U.S. Supreme Court Justice Ruth Bader Ginsburg has developed a breathtaking legal legacy while becoming an unexpected pop culture icon. But, without a definitive memoir, the unique personal journey of this diminutive, quiet warrior’s rise to the nation’s highest court has been largely unknown, even to some of her biggest fans – until now. RBG is a revelatory documentary exploring Ginsburg’s exceptional life and career from Betsy West and Julie Cohen, and produced by Storyville Films and CNN Films.